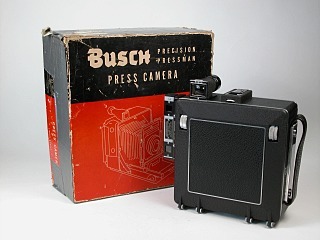 The Busch Pressman model D is a finely crafted 4x5 inch press camera. 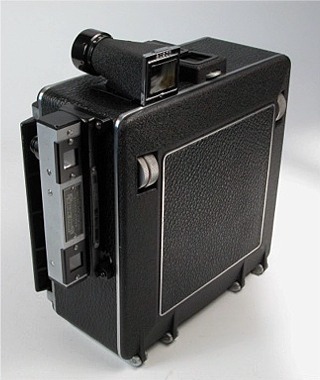 Viewing options include a ground glass screen, an eyelevel optical viewfinder with parallax correction and a wire-frame sports finder, also with parallax correction. The body is made of aluminum. This is a sturdy, precise, smoothly functioning camera that closes down to a compact and neat package. I think the Busch Pressman model D has more of that precise, silky feel of a Linhof camera than any other American-made 4x5. Engineering, materials and assembly are first-rate. This example is in excellent condition. 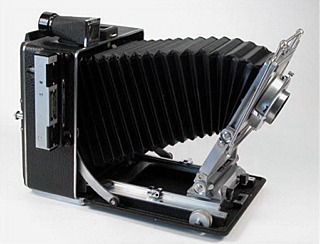 The double-extension bellows extends twelve inches - useful for close-ups and telephoto lenses. The bellows is supple, light-tight and in perfect condition. Two wheels are provided for rack and pinion focus. The rack and pinion is smooth, sure and quick. Focus can be locked in any position. 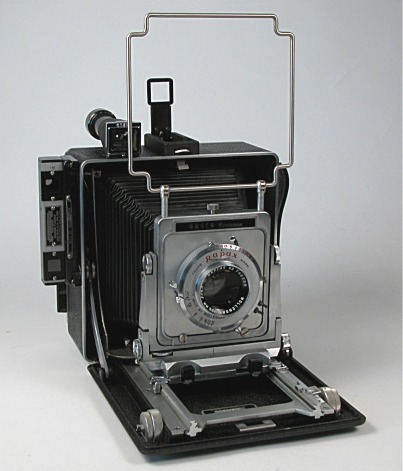 For image and perspective control, the model D features rise, shift, and tilt movements. The drop bed provides drop movement and helps control vignetting when a wide-angle lens is mounted. The viewing hood is removable. 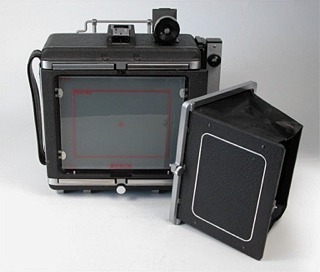 The ground glass screen covers the 4x5 format but also includes a 3 1/4 x 4 1/4 inch frame line. The spring back accepts all standard spring back accessories. 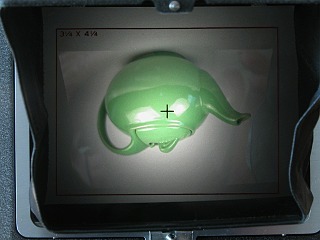 View of an image in the ground glass screen. 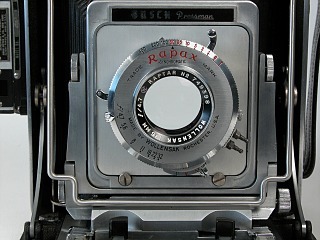 The Wollensak Rapax Synchromatic shutter features speeds from 1 to 1/400 second, time, and bulb. It is equipped with a press-focus lever and M, F and X flash synchronization. A bi-post type connector or adaptor is required for connection to flash units. The shutter and diaphragm blades are dry (that's a good thing). The shutter is strong and operates without hesitation at all speeds. The coated 135mm f4.7 Wollensak Raptar lens stops down to f32. The lens is clean, clear and free of scratches and cleaning marks. 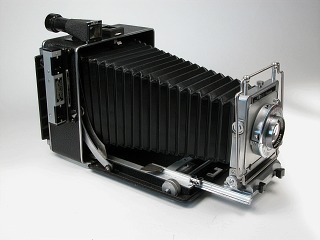 Graflex Graphic lens boards cannot be used on a Busch Pressman. Used and new old-stock Busch boards are not difficult to locate, though. The standard 1/4 x 20 tripod socket is mounted on the camera bottom. The revolving back eliminates the need for a second tripod socket. 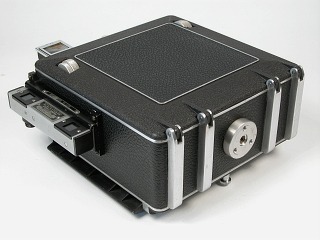 The Hugo Meyer coupled rangefinder is accurate, clear, bright and contrasty. Rangefinder operation is quick and sure. The heavy leather hand strap is very comfortable. It can be adjusted to fit a range of hand sizes. 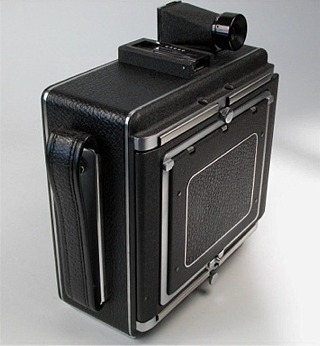 This is a compact 4x5 camera and a neat package when closed. The model D revolving back locks in 90 degree increments. Switching between vertical and horizontal compositions does not require dismounting the camera from a tripod. The original box is included. It is in poor condition.